2018 MN Cyber Career Expo – June 27! 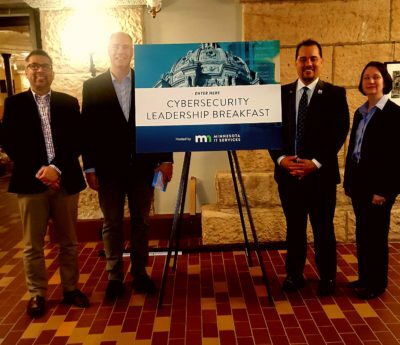 Kyle Swanson and Faisal Kaleem represented MN Cyber at the MN IT Cybersecurity Leadership Breakfast on April 18, 2018. Also shown are Representative Eric Lucero and MN IT Commissioner Brig. Gen. Johanna Clyborne. 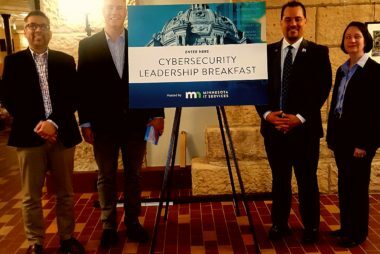 MN Cyber Academy launched in 2018 with over $300,000 in funding from NSA and NSF. More than 90 veterans and individuals under-represented in tech fields will be trained for high-paying, high-demand cybersecurity fields.